Five years after this sleeper hit took on the world of IT and flipped it on it's head, the 5th Anniversary Edition of The Phoenix Project continues to guide IT in the DevOps revolution. 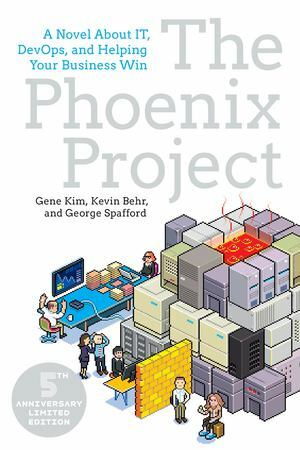 In this newly updated and expanded edition of the bestselling The Phoenix Project, co-author Gene Kim includes a new afterword and a deeper delve into the Three Ways as described in The DevOps Handbook. Bill, an IT manager at Parts Unlimited, has been tasked with taking on a project critical to the future of the business, code named Phoenix Project. But the project is massively over budget and behind schedule. The CEO demands Bill must fix the mess in ninety days or else Bill's entire department will be outsourced. With the help of a prospective board member and his mysterious philosophy of The Three Ways, Bill starts to see that IT work has more in common with a manufacturing plant work than he ever imagined. With the clock ticking, Bill must organize work flow streamline interdepartmental communications, and effectively serve the other business functions at Parts Unlimited. In a fast-paced and entertaining style, three luminaries of the DevOps movement deliver a story that anyone who works in IT will recognize. Readers will not only learn how to improve their own IT organizations, they'll never view IT the same way again.